For the holiday season try a new twist on a classic dessert. 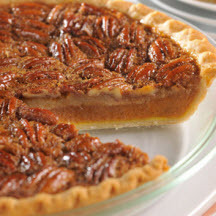 Savory pumpkin balances out the sweetness of traditional pecan pie nicely. For Pumpkin Layer: Combine pumpkin, 1/3 cup sugar, 1 egg and pumpkin pie spice in medium bowl; stir well. Spread over bottom of pie shell. For Pecan Layer: Combine corn syrup, 1/2 cup sugar, 2 eggs, butter and vanilla extract in same bowl; stir in nuts. Spoon over pumpkin layer. Bake for 50 minutes or until knife inserted in center comes out clean. Cool on wire rack.